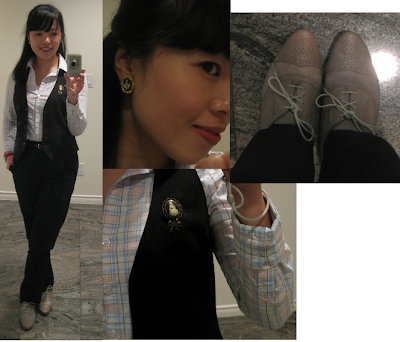 "I feel kind of Annie Hall-ish today," I said to my manager when she complimented this outfit. Indeed, borrowing inspiration from menswear has been one of my favourite "look put together in a hurry" strategies lately. Fuchsia lips and cameo jewelry kept it from looking too boyish though. I also like the subtle juxtaposition of the patterns and textures: the gloss of burgundy patent leather, the blue and pink check, chalk pinstripes on black, the distinctive wingtip perforation on the shoes. Love love love the shoes (if they are Camper, they also must be super comfortable!) and the brooche! Love them oxfords! Got your letter yesterday..will reply asap of course! This look would be so awesome with wide leg jeans. Really? Those are Camper oxfords! Nice - I'll have to check them out! Where would I find the serial number? It's got the Chanel Paris on it and then the thick chain..I think it's from the eighties..it's a bit beaten up inside..
Mmmm... Oxfords. <3 Truly a prep staple, desirable in any wardrobe, male or female.